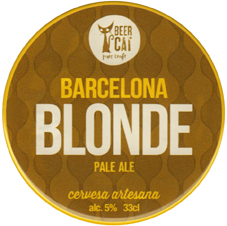 Beer Cat has been brewing since 2013 and was set up with help from Manchester’s Cloudwater head brewer James Campbell, The whole vibrant craft beer revolution in Spain can actually be traced back to 1992 when Liverpudlian ex-pat Steve Huxley opened the ill-fated brew-pub, the Barcelona Brewing Company. Though recently big brands such as Brewdog and Mikkeller have moved in, there is plenty of interest and activity on the micro level. BeerCat is based in Vilafranca del Penedès, the capital of the Penedès wine and Cava region situated about 40km from Barcelona. The brewery is housed in a former wine bodega and draws inspiration from the surrounding countryside and viticulture to develop a niche range of beers. First brewed in collaboration with Magic Rock, La Segadora is flavoured with lemon peel – one of BeerCats recipes using regional ingredients. Others doing so include Flor d`Ordal which is based on the famous dry-cultivated Ordal peaches, and El Taronger, which has the zest of local bitter oranges added.